We will make sure you look your best. If you want quality headshot prints that make you look your best, you've come to the right place. Our specialty is custom-designing our layouts to complement your photo. We know that the right border and font can make your photo pop, and the wrong border and font can draw attention away from where it should be: on you! Let us "Rock Your Headshot," and the results will be professional, yet eye-catching. 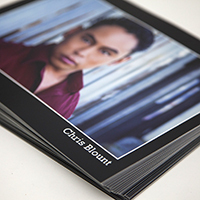 Our headshots are printed on real photo paper for maximum quality, color, and sharpness. If you need multiple looks, we let you split your order between photos at no additional charge (minimum of 25 prints per look). Turnaround is typically 1-3 days (ask us about rush orders). ©2014 The Photoshop - All rights reserved.